A snapshot is a saved state of a virtual machine. Snapshots can be created manually or automatically when the virtual machine is running. 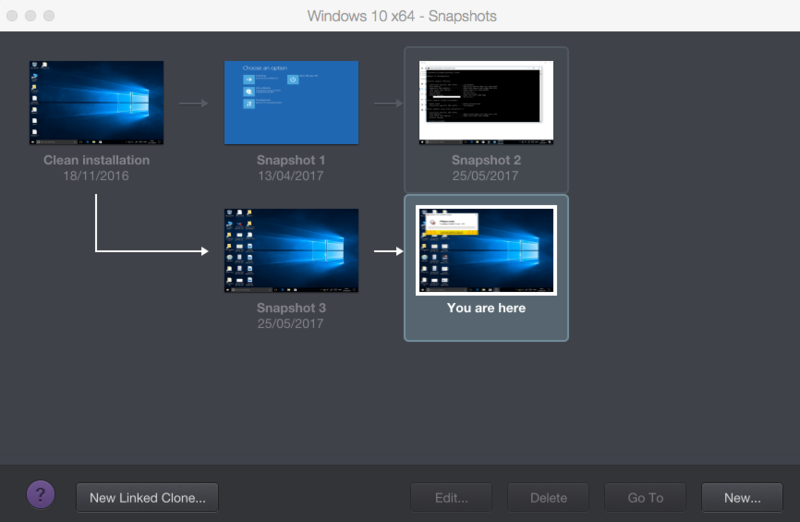 After you make the snapshot, you can continue working with the virtual machine and revert to the created snapshot at any time of your work. Warning: You can create the snapshot at any time. But it is recommended to complete all operations of installing, downloading or writing to external devices before taking the snapshot. You should also complete or cancel any transactions performed via the virtual machine in external data bases. 1. Snapshots cannot be created for Windows virtual machines which use the Boot Camp partition. Start Parallels Desktop and the virtual machine in which you want to create the snapshot. On Mac menu bar find Parallels logo > choose Actions > Take snapshot. 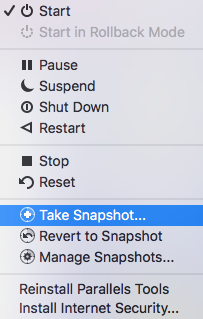 In the appeared window specify the name of the snapshot and click OK.
Start Parallels Desktop and the virtual machine in which you want to revert to the snapshot. On Mac menu bar find Parallels logo > choose Actions > Revert to Snapshot. In the appeared confirmation message click Yes to be taken back to the last created snapshot. 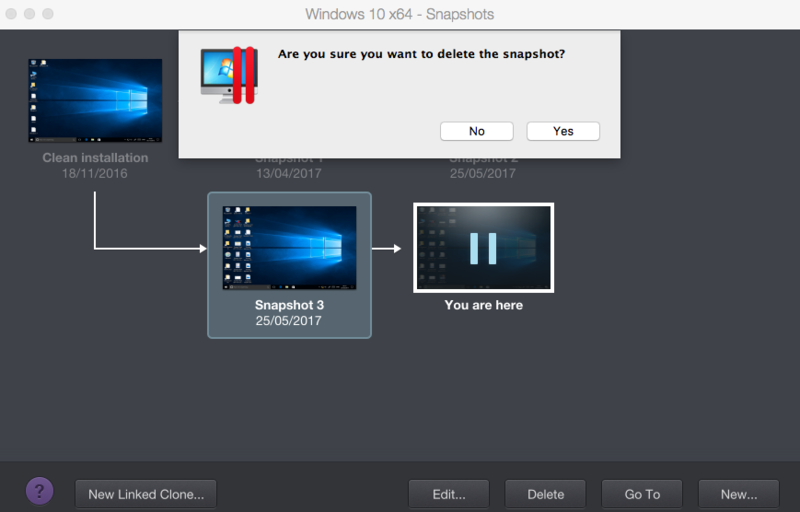 Start Parallels Desktop and the virtual machine in which you want to delete the snapshot. On Mac menu bar find Parallels logo > choose Actions > Manage Snapshots. In the appeared Snapshots Manager menu choose the snapshot you want to delete > click Delete. Finish the removal operation by choosing Yes in the appeared confirmation message. NOTE: When you delete an intermediate snapshot, the information it contains is merged into the next snapshot. The SmartGuard functionality allows you to automate snapshots' creation. NOTE: SmartGuard is available only when the Rollback Mode feature is disabled. Start Parallels Desktop and the virtual machine in which you want to enable SmartGuard feature. Open the virtual machine configuration > go to Backup tab > enable SmartGuard option. If you select this option, a snapshot will be taken every 24 hours. Time Machine, when backing up your Mac, will not back up the entire virtual machine, but only its latest snapshot. This allows you to reduce the amount of data that Time Machine backs up, to reduce the time Time Machine spends backing up the virtual hard disk(s), and to minimize the risk of data loss or corruption when restoring the virtual machine hard disk(s) from the Time Machine backup. 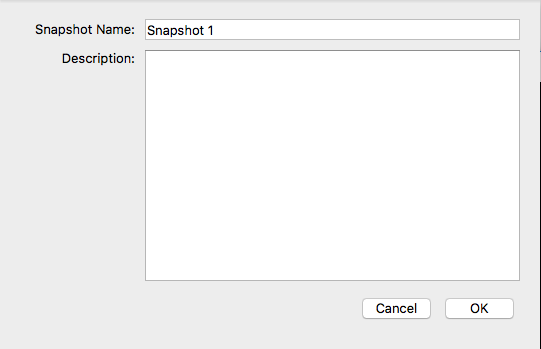 If you want to know when it is time to make the next snapshot and to be able to reject the snapshot creation, enable the Notify me before snapshot creation option. 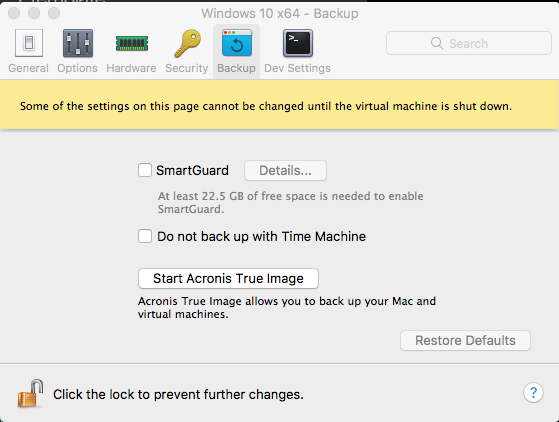 NOTE: If you use Time Machine to back up your Mac, you can configure the virtual machine to make Time Machine back up only the changes made since the latest snapshot but not the whole hard disk. To do it, choose Optimize for Time Machine and click OK.
Use the Take a Snapshot Every field. You can customize and set the amount up to 48 hours.